Today's Draw: The Eight of Amphorae from the Sola Busca in the Positive Influences position from the Deck of 1000 Spreads. Do you sometimes feel like life is a long string of obligations and errands? Are you task-oriented, saving the little distractions of life for a time when your plate is clear? What can you do today to bring a moment of joy into your life? The mailman delivered this very special deck today. It's special for a number of reasons. First, it's a faithful reproduction of a deck that was created in 1490. I'd heard of the Sola Busca before, but didn't know a whole lot about it. We often consider the Rider Waite to be the first deck that had fully illustrated pip cards (the cards numbered 1-10 in each suit). But it turns out the Sola Busca was the first...by more than 400 years. Another cool thing is that this deck came to me from Italy. It's always fun to receive a package from a foreign country. And it's extra fun because my mailman knows how anxiously I await these packages. One time I wasn't home when he came to deliver one and I tracked him down along his route and begged for the package. This amused him. Anywho, I'm telling you all of this for a reason. 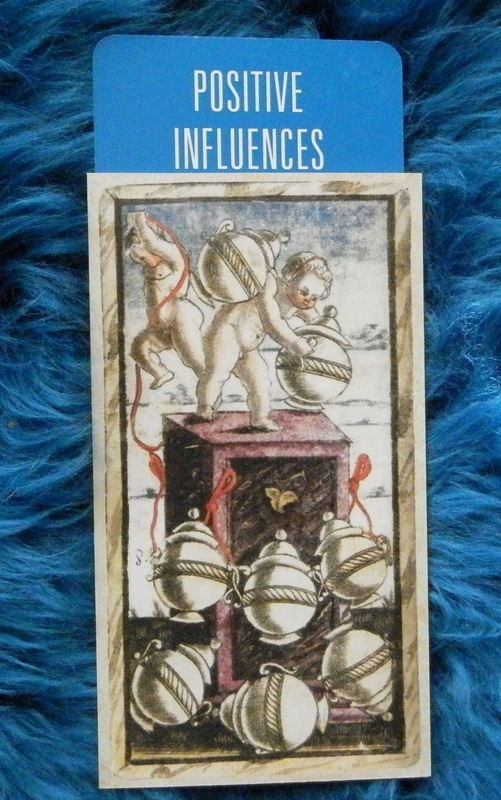 Because the meaning for this card in this deck is "a moment of joyful distraction." Tarot gives me many of those moments. I get one when I look through a deck for the first time. Or when I'm teaching a class. Or giving a reading. 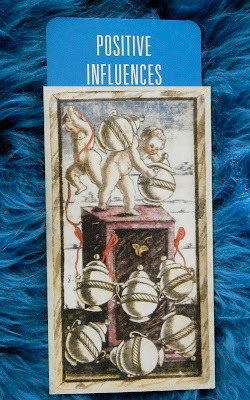 Or even just chatting with someone else who is as into tarot as I am. These moments of joyful distraction are definitely positive influences in our lives. I'm a pretty task oriented kind of person. So if the goal is to go grocery shopping, that's what I do. I don't dawdle. I don't hit a few shops before I get to the grocery store—unless, of course, I have errands to run there. I'm just in and out and home. But right next to my grocery store is a magical land called the Hollin Hall Variety Store. Anyone who has ever been there will tell you it's full of moments of joyful distraction. It's an old-time variety store with a little of everything in it. One of my favorite things is to have something in mind to shop for and see if they have it. They always do. I don't know how they do it. I thought I was going to finally stump them one day when I needed a tiara. But no. They had three to choose from! Thing is, I never go there unless I need something. I go to the grocery store right next door and as I'm walking through the parking lot, I think "I wish I needed something at the Variety Store." But I don't. So I don't visit. Isn't that silly? Chances are you might rob yourself of joyful distractions in your day, too. Sometimes a new tarot deck will sit here for a couple of days before I look through it. Or I'll drive past a place I want to investigate while running errands and choose not to stop. Sure, we all need to get stuff done. But letting moments of joyful distraction pass us by cheats us out of life! I'd rather my tombstone say "she never let a joyful moment pass her by" than "she got all her errands done"....haha. So that's what today's draw has come to remind us of today...that life needs to be lived and enjoyed in between the errands and obligations and needs of daily life. And we need to do it as often as possible. Some of these things, like the Variety Store, will still be there when you get around to it. But really, is that the way we should be living...putting joy on the bottom of our priority list? What can you do to bring a moment of joy into your life today?